I can be quite lazy sometimes so when I came across this recipe in Mark Bittman’s book for no-work bread, I decided that I’d give it a try, since after all it claimed that very minimal work had to be done. 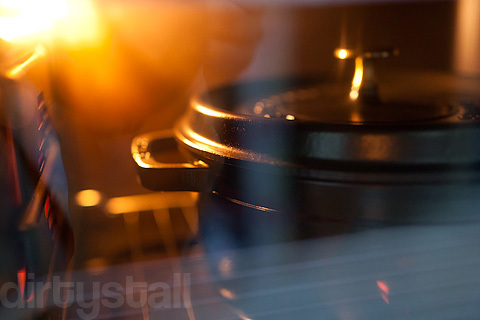 Supposedly it will give you an artisanal loaf with kneading, fancy ingredients or special equipment – all you need is an oven and a covered pot. 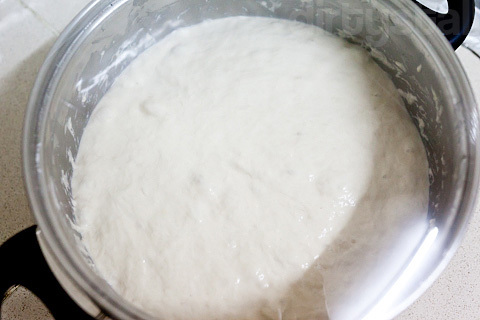 The slow fermentation process takes very long so you have to start at least 24 hours in advance. 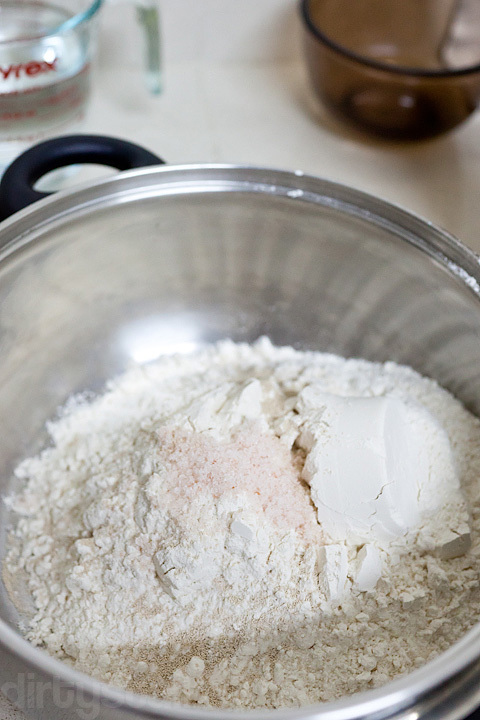 Start with 4 cups of bread flour, 2 tsp of salt and 1/2 tsp of instant yeast. Then you mix it all together. 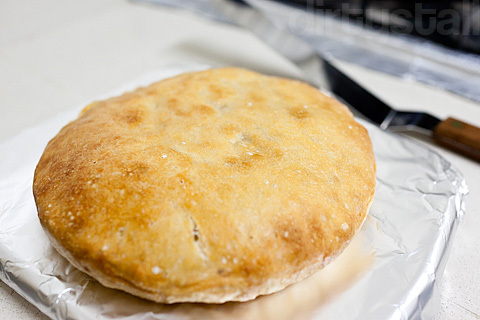 Cover with plastic wrap and leave to ferment for about 18 hours. 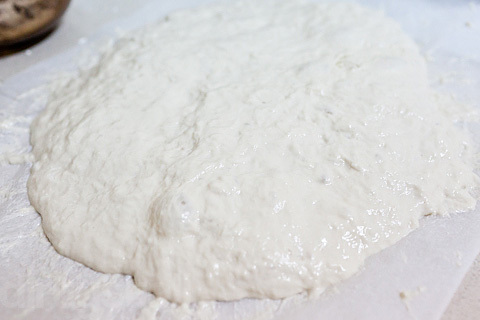 After that, turn it out and flour its surface to make it more malleable, then fold it over once or twice. Then you let it rise again for another 2 hours, after which it should be less sticky. 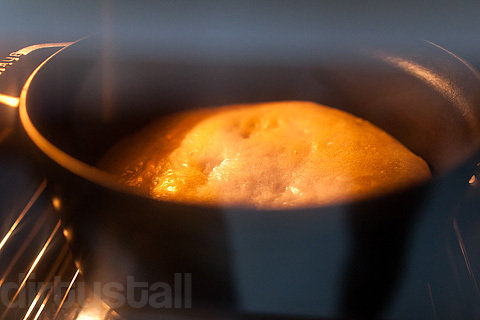 30 mins before the dough is ready, preheat the pot in the oven to 230°C, then put the dough in the pot for about 30 mins. Bake it for another 20-30 mins without the lid. Here’s how it looks out of the pot. And well I think it’s a failure because the bread was too dense and tough. 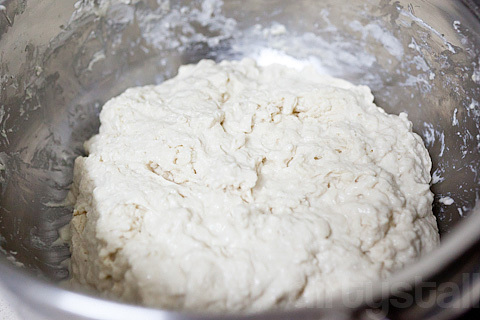 But it was an interesting experiment and repeated trials should yield better bread. 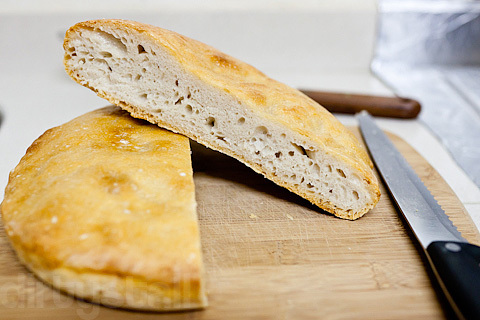 8 Responses to "No Work Bread"
Can’t wait to try this, looks good! Yeah but at least i didn’t spend too much effort on it hahaha! wow 24 hrs to do this! Interesting – do you think the humidity impacts it? I tried to do the same but only did the 8hour rise and thought that was why my bread flopped (it looked similar to yours and did not taste as nice as it looked). I think that’s quite possible, I hear the humidity is the biggest obstacle in baking bread in Singapore, besides the water.